1 OF 3 PRETTY CONVERTED BARNS SET IN ROLLING COUNTRYSIDE ON THE COAST SLEEPS 6 2 These detached and semi-detached properties have been lovingly restored and stylishly furnished by the owners who have gone to great lengths to offer beautiful accommodation with all the contemporary conveniences imaginable. The perfect location for a relaxing holiday near the sea set on the East Norfolk Coast. Set on the edge of this pretty seaside village the sea is a short walk away with wide and gently sloping beaches ideal for picnics and relaxing. Further afield you will find stunning lighthouses and windmills buildings that make Norfolk so famous. The Norfolk Broads are a short drive along with Great Yarmouth and its pleasure beach. With lots of wide open space this quiet corner of Norfolk is a great place to forget your busy life and get some fresh air. On guests arrival at this stunning converted barn entering the barn you immediately get the wow factor the double aspect glazed frontage lets so much light into a modern and contemporary open plan kitchen/lounge/dining area the modern well equipped kitchen compliments the traditional exposed brick wall having an electric oven and hob dishwasher microwave fridge/freezer washing machine and a breakfast bar with stools leading to a dining area with table and chairs and views on the garden a lounge area with woodburner (first basket of logs included) feature exposed brick wall smart TV/DVD and access to garden and patio area. 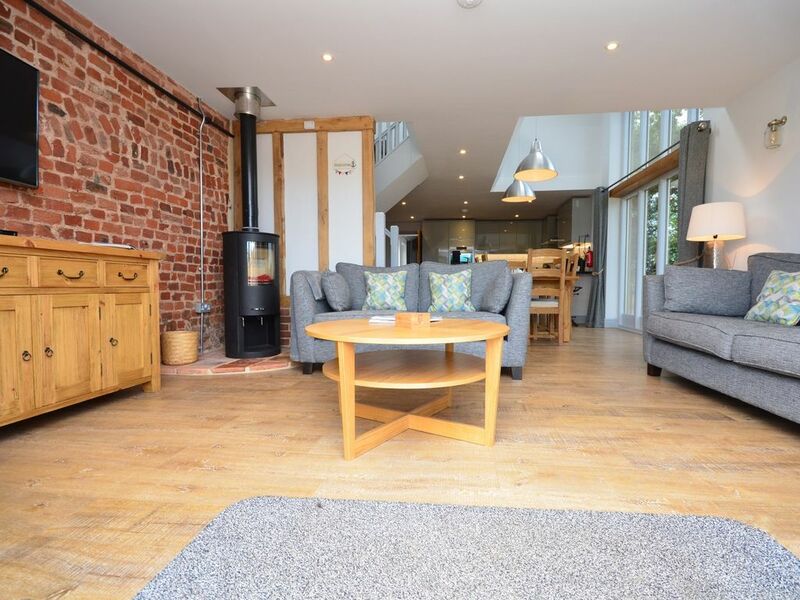 There are two spacious twin bedrooms on the ground floor with exposed timber beams with smart TV in each room. The family bathroom comprising of bath separate shower cubicle WC and wash hand basin. Stairs lead to the first floor landing the master king size bedroom having smart TV an en suite shower room having shower cubicle WC and wash hand basin. A second lounge area on the first floor with sofa bed TV/DVD and games console. There is a Juliette balcony on the first floor. Outside: A private enclosed patio area with garden furniture and BBQ. Off road parking.